Aloha nui kākou mai ka lā hiki mai i kahikina a i ka welo ʻana o ka lā kaulana o Kāne... EŌ! We are Sacred Mauna Kea Hui, an advocacy group, whose goal is to preserve and maintain the supreme sacredness of the summit of Mauna Kea. Its pristine endangered species environment and the main Hawai’i Island fresh water aquifer are located a stone’s throw away from the planned 5000 gallon toxic waste container of the Thirty Meter Telescope (TMT). We are also fighting against our cultural erasure and ethnocide here in Hawai’i! PLEASE HELP US STOP THE THIRTY METER TELESCOPE (TMT) PROJECT! Mauna Kea is the most sacred place to Hawaiians and one of the most sacred places to the people of Polynesia. Mauna Kea is the first born child of our gods Wākea and Papahānaumoku. Wākea means “vast expanse” of the heavens, and is our sky father. Papahānaumoku is our earth mother, her name means “the foundation (papa) who gave birth (hānau) to our islands (moku)” because our islands were created from her body, the earth. The summit of Mauna Kea, the highest point in all of the Pacific, is where Papa and Wākea came together to create our world. The “piko”, the umbilical cord or center of one’s being has tied us as Kānaka Maoli to the summit of Mauna Kea for generations. For generations, we have referred to the summit as “ka piko kaulana o ka ‘āina” (“the famous summit of all the land”) to describe its sacredness and wonders. Mauna Kea sits on the main aquifer for the island of Hawai‘i. There are many toxic chemicals including mercury needed for the use of the telescopes; chemicals from other telescopes in place have already leaked into the soil. TMT construction vehicles and equipment have also spilled oil into the ground. The summit is home to rare, endangered species such as the palila bird and the wekiu bug, found nowhere else on earth. The wekiu bugs’ habitat has already been damaged from the building of the previous 13 telescopes on the summit, and the TMT will damage a much larger area. It will be 18 stories tall, will dig into the ground the equivalent of over two stories of a building, and will cover an area of 8 acres. Current building laws on the island do not even allow a building that tall to be built. There are over 100 sites of worship documented by archaeologists spread across the summit, many of these will be destroyed if construction proceeds. There is our sacred Lake Waiau near the summit, which is associated with the Hawaiian snow goddess Poli‘ahu and a goddess of the mist named Lilinoe. Lake Waiau has been drying up, because previous construction has cracked the soil, causing the sacred waters made of melted snow to slowly leak away. TMT construction will further damage the area, and cause the lake to dry up faster and completely disappear. Visit our knowledge-well at sacredmaunakea.wordpress.com to learn more. Please come to the summit of the Mauna and support the brave warriors, who are protesting at 9000 feet above sea level, indefinitely. Or... if you can't be physically on the summit of Mauna Kea, please support from where you are! Donations for flights to and from Hawai’i between our other Hawaiian islands, as well as accommodation, food, transportation, etc. are needed. Although many selflessly support our hard-working advocates in all ways possible, the cost of fighting a 1.4 billion dollar international conglomerate is a challenge that we gladly meet. As we exhaust our resources, we turn to you, the people of Hawai’i and the world, who wish you could help in some way, but as much as you would like to, you can't be on Mauna Kea. This is one way your participation can be profound and meaningful from right where you are! We offer our aloha and this simple video of a song composed for our sacred Goddess, Poliahu, in hopes it will inspire your needed charity. KA PIKO KAULANA O KA AINA!" Mauna Kea Update: We need you now more than ever! Mahalo for all your support. No matter what we will continue to lay our liberty and freedom down to protect the SACRED. Let us exaust all civil routes and turn again to the Supreme Court who has constantly sided with humanity in this case. Let's fulfill our kuleana and responsibilities. Please consider sharing our fundraiser and donating if able. Direct donations may be made payable to Kamahana Kealoha and mailed to Sacred Hui c/o Kamahana Kealoha, 89-564 Mokiawe Street, Waianae, Hawaii 96792. Regarding TMT PERMIT: "The Board will entertain oral arguments on Wednesday 20, 2017, commencing 9:00 a.m. the Naniloa Hotel Crown Room, 93 Banyan Drive, Hilo, Hawai’i, 96720. Each party to the case shall have fifteen minutes to present oral arguments before the Board... Petitioners (1) Mauna Kea Anaina Hou and Kealoha Pisciotta, (2) Clarence Kukauakahi Ching, (3) the Flores-Case ‘Ohana, (4) Paul Neves, (5) Deborah J. Ward, (6) KAHEA: The Hawaiian Environmental Alliance, and Opposing Intervenors (7) Mehana Kihoi, (8) Chase Michael Kaho‘okahi Kanuha, (9) Harry Fergerstrom, (10) Joseph Kuali‘i Camara, (11) Jennifer Leina’ala Sleightholm, (12) Cindy Freitas, (13) William Freitas, (14) The Temple of Lono, (15) Kalikolehua Kanaele, (16) Stephanie-Malia:Tabbada, (17) Tiffnie Kakalia, (18) Glen Kila, (19) Dwight Vicente, and (20) Brannon #MeleKamahana Kealoha shall present after the applicant and intervenors. We are progressing in protective advocacy but cannot continue to win without your prayers and support. The hardships enforced with DLNR enforced fees, shelter, food, transportation and other necessities because of exclusive proceedings in Hilo is again more than most Sacred Hui participants can shoulder. Now that we have been present like many others before, and have finally been afforded a essential step in the due process, the contested court case hearing is over. But aole pau ka hana, the work is not done. And we know that we would not be here without aloha from all over the world from ALL of us. If you believe that all our vested voices should be acknowledged or you just cant make it to the many opportunities to advocate, but want to help, Sacred Hui will continue to influence protection of our Sacred Mauna and endangered species environments- if you believe that industrializing of this would-be pristine environment (rezoned by the State under the guise of protection) is WRONG, let us stand together. It is a KAKOU effort and we cannot do it without you. We need you now more than ever! Mahalo for all your support. No matter what we will continue to lay our liberty and freedom down to protect the SACRED. Let us exaust all civil routes and turn again to the Supreme Court who has constantly sided with humanity in this case. Let's fulfill our kuleana and responsibilities. Please consider sharing our fundraiser and donating if able. "The Board will entertain oral arguments on Wednesday 20, 2017, commencing 9:00 a.m. the Naniloa Hotel Crown Room, 93 Banyan Drive, Hilo, Hawai’i, 96720. Each party to the case shall have fifteen minutes to present oral arguments before the Board. Time may not be assigned from one party to another. The Board may elect to ask questions of any party once they have completed argument; this time will not count towards the fifteen-minute total. 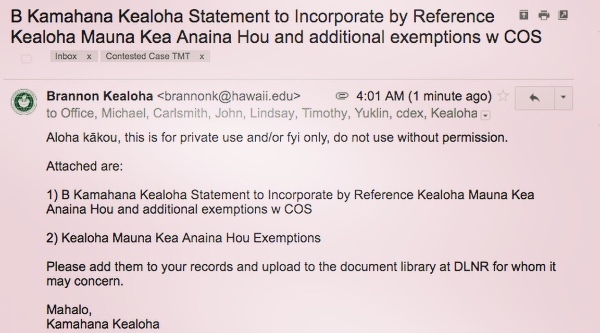 Petitioners (1) Mauna Kea Anaina Hou and Kealoha Pisciotta, (2) Clarence Kukauakahi Ching, (3) the Flores-Case ‘Ohana, (4) Paul Neves, (5) Deborah J. Ward, (6) KAHEA: The Hawaiian Environmental Alliance, and Opposing Intervenors (7) Mehana Kihoi, (8) Chase Michael Kaho‘okahi Kanuha, (9) Harry Fergerstrom, (10) Joseph Kuali‘i Camara, (11) Jennifer Leina’ala Sleightholm, (12) Cindy Freitas, (13) William Freitas, (14) The Temple of Lono, (15) Kalikolehua Kanaele, (16) Stephanie-Malia:Tabbada, (17) Tiffnie Kakalia, (18) Glen Kila, (19) Dwight Vicente, and (20) Brannon #MeleKamahana Kealoha shall present after the applicant and intervenors. Parties may elect to reserve time from their allotted fifteen minutes for rebuttal argument. Rebuttal arguments will take place once all parties have completed their initial arguments. There is significant public interest in this contested case and seating on the day of oral argument will be limited." See #sacredmaunakea.com or the link on our InstaGram Bio @da_kamahana_project for entire post. The Hawaiian Star Priest, Michael Kumukauoha Lee, took the witness stand on Monday to provide testimony in the Thirty Meter Telescope contested case hearing. Lee was presented by contested case participant Harry Fergerstom, who is opposed to building the TMT on Mauna Kea. 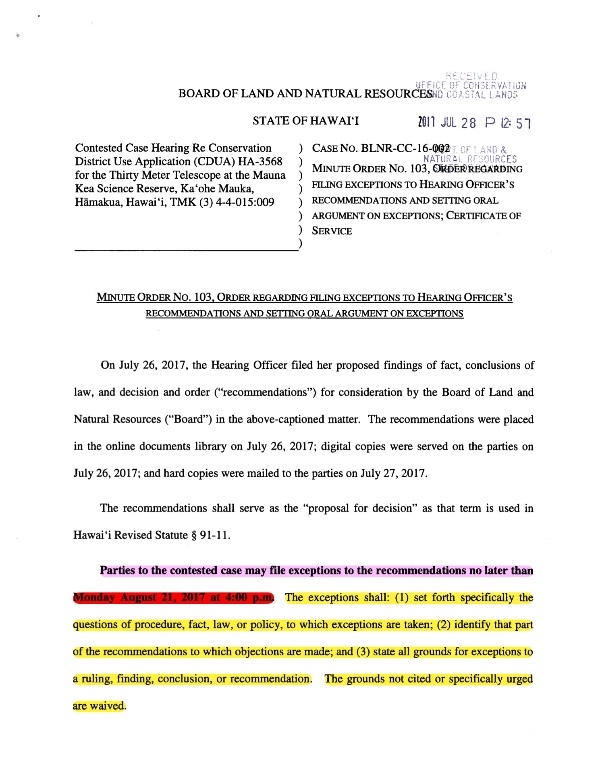 It was the first witness in the proceeding to be called by an opponent of the project who is not a part of the original “Mauna Kea Hui” of petitioners who participated in the first contested case in 2011. Lee spoke of the family burials located on Mauna Kea, his ancestral knowledge of the summit and its cultural sites, and said the mountain is a “living mountain” that must be protected. The video above is just a segment of Lee’s testimony. We plan to present the entire testimony and cross examination soon and will post the link here when it is published. Mahalo to ALL of you for standing up for ALL of US and for the Mauna. Eo!